Consistency and accessibility are essential to student success in the Fundamentals of Nursing course. With its clear, approachable, writing style, Kozier & Erb’s Fundamentals of Nursing sets the foundation for nursing excellence. Coverage of the key concepts of contemporary nursing, as well as the latest nursing evidence, standards, and competencies, helps prepare readers to become effective nurses. To help students develop their clinical-reasoning abilities, new QSEN features draw connections to actual nursing practice. All basic and fundamental skills for the registered nurse are described within the nursing process. Students will learn to think like nurses as they see how the material they are reading is applied in nursing practice. This title is also available with MyNursingLab—an online homework, tutorial, and assessment program designed to engage students in the Fundamentals of Nursing course and improve results. Its guided learning path is proven to help students think like a nurse as they move beyond memorization to true understanding through application. NOTE: You are purchasing a standalone product; MyNursingLab does not come packaged with this content. If you would like to purchase both the physical text and MyNursingLab, search the Pearson website. MyNursingLab should only be purchased when required by an instructor. Students, if interested in purchasing this title with MyNursingLab, ask your instructor for the correct package ISBN and Course ID. Instructors, contact your Pearson representative for more information. Because the Berman textbook and Skills books are written by the same author team, fundamentals students experience a seamless presentation, style, and experience throughout. 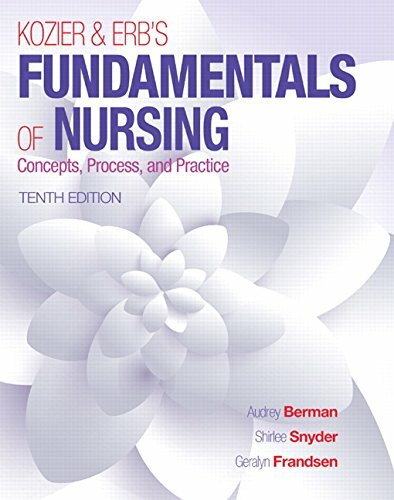 Contact your Pearson representative to package Kozier & Erb’s Fundamentals of Nursing, Tenth Edition with the authors’ Skills in Clinical Nursing, Eighth Edition ISBN: 013399743X.